After experiencing sexual misconduct it is important to remove yourself from physical, mental, and/or emotional danger. Please go to a place where you feel safe. This could be a friend, spouse or RA’s room, Student Health and Wellness Promotion, or contact Campus Safety or 911. It is a victim’s choice whether or not to report an incident of sexual misconduct. However, it is important for victims to speak with someone who can provide them with their appropriate resources and options. Advocacy is an important source of support. Learn more here about advocacy. 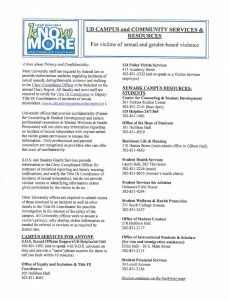 UDPD will provide transportation to Student Health Service or Christiana Hospital for University students. Sexual Misconduct can be a traumatic experience. You may feel unsafe, overwhelmed, or guilty. Some may even experience symptoms of Post-Traumatic Stress Syndrome. Because of this, please utilize these campus resources to take care of your mental and emotional health. 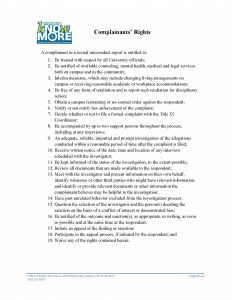 You are afforded important rights as a complainant. Or submit a Title IX Reporting Form. Call 911; tell them the type of crime and where it occurred. They will dispatch the appropriate police agency to assist you.